April 16, 2014: Earth's poles are separated by four oceans, six continents and more than 12,000 nautical miles. Turns out, that's not so far apart. New data from NASA's AIM spacecraft have revealed "teleconnections" in Earth's atmosphere that stretch all the way from the North Pole to the South Pole and back again, linking weather and climate more closely than simple geography would suggest. For example, says Cora Randall, AIM science team member and Chair of the Dept. of Atmospheric and Oceanic Sciences at the University of Colorado, "we have found that the winter air temperature in Indianapolis, Indiana, is well correlated with the frequency of noctilucent clouds over Antarctica." Noctilucent clouds, or "NLCs," are Earth's highest clouds. They form at the edge of space 83 km above our planet's polar regions in a layer of the atmosphere called the mesosphere. Seeded by "meteor smoke," NLCs are made of tiny ice crystals that glow electric blue when sunlight lances through their cloud-tops. AIM was launched in 2007 to investigate these "night-shining" clouds, to discover how they form and to learn about their inner chemistry. As is often the case, however, when exploring the unknown, researchers found something they weren't even looking for: teleconnections. "It has been a surprise," says Hampton University professor of atmospheric and planetary science James Russell, Principal Investigator of the AIM mission. "Years ago when we were planning the AIM mission, our attention was focused on a narrow layer of the atmosphere where NLCs form. Now we are finding out this layer manifests evidence of long-distance connections in the atmosphere far from the NLCs themselves." One of these teleconnections links the Arctic stratosphere with the Antarctic mesosphere. 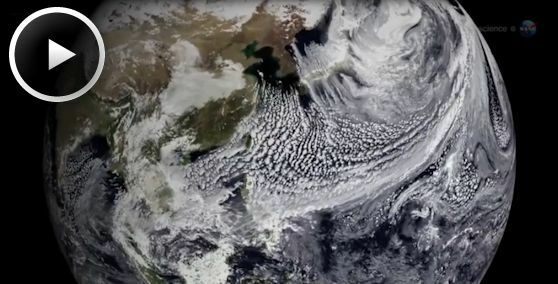 "Stratospheric winds over the Arctic control circulation in the mesosphere," explains Randall. "When northern stratospheric winds slow down, a ripple effect around the globe causes the southern mesosphere to become warmer and drier, leading to fewer NLCs. When northern winds pick up again, the southern mesosphere becomes colder and wetter, and the NLCs return." 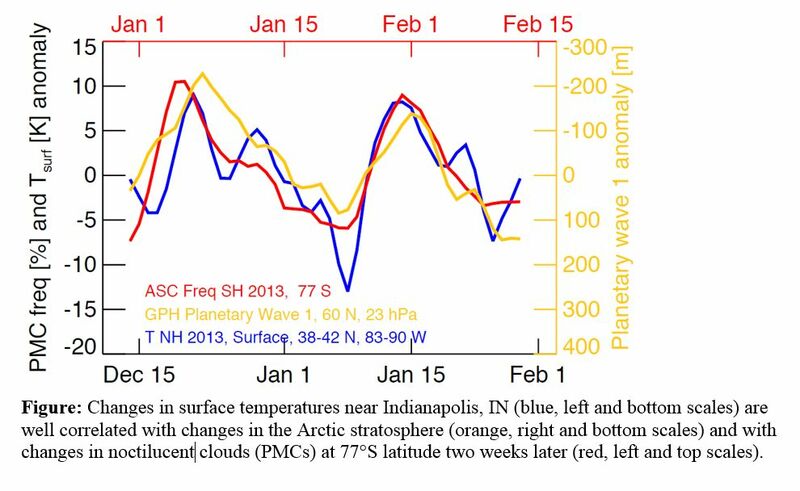 The winter air temperature in Indianapolis is correlated with the frequency of noctilucent clouds over Antarctica. This January, a time of year when southern NLCs are usually abundant, the AIM spacecraft observed a sudden and unexpected decline in the clouds. Interestingly, about two weeks earlier, winds in the Arctic stratosphere were strongly perturbed, leading to a distorted polar vortex. "We believe that this triggered a ripple effect that led to a decline in noctilucent clouds half-way around the world," says Laura Holt of the University of Colorado's Laboratory for Atmospheric and Space Physics. "This is the same polar vortex that made headlines this winter when parts of the USA experienced crippling cold and ice." Holt took a careful look at meteorological data and found that, indeed, there was a statistical link between winter weather in the USA and the decline in noctilucent clouds over Antarctica. "We picked Indianapolis as an example, because I have family living there," says Randall, "but the same was true of many northern cities: cold air temperatures on the ground were correlated with NLC frequencies high above Antarctica two weeks later," she says. The two week delay is, apparently, how much time it takes for the teleconnection signal to propagate through three layers of atmosphere (the troposphere, stratosphere and mesosphere), and from pole to pole. It is a complicated topic, but this much is clear: "NLCs are a valuable resource for studying long-distance connections in the atmosphere," says Russell, "and we are just getting started."